Former Ritzman Pharmacy at NEOMED now fully-owned by the University. 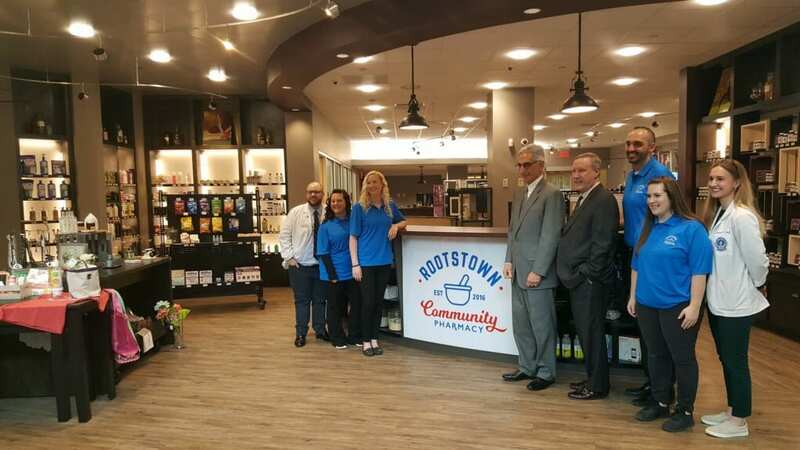 The College of Pharmacy at Northeast Ohio Medical University announced the new name of its community pharmacy ― Rootstown Community Pharmacy ― and revealed its new logo during an open house event held Tuesday, April 2 at noon. The event took place inside the pharmacy, which is located in the NEOMED Education and Wellness (NEW) Center. The pharmacy, which first opened its doors three years ago, originated as a joint venture with Ritzman Pharmacy. Named the Ritzman Pharmacy at NEOMED, the pharmacy of the future emphasized a consultative approach and treatment of the whole person. NEOMED owned 51 percent of the pharmacy and Ritzman owned 49 percent. In January, all Ritzman Pharmacies ― with the exception of Ritzman Pharmacy at NEOMED ― were acquired by CVS. Upon hearing that CVS was not interested in assuming Ritzman’s 49 percent ownership, NEOMED decided to take full ownership of the pharmacy. Rootstown Community Pharmacy currently fills about 1,800 prescriptions a month. According to Dr. Kasmer, the pharmacy needs to fill 3,000 prescriptions each month to become profitable, which he says is on pace to happen in two to three years. “Ritzman was a great partner. We learned a lot about operating a pharmacy from them and we are prepared to take our pharmacy to even greater heights,” said Dr. Kasmer. The pharmacy is open Monday through Friday from 8 a.m. to 6 p.m., and the University wants to make it even more accessible. Later this year, the University plans to move the pharmacy to another part of the NEW Center which would allow it to install a drive-up window. “Complete ownership, a new name and a new look are just the beginning. Rootstown Community Pharmacy is an investment in our community, our students and the College of Pharmacy,” added Dr. Kasmer. For more than 40 years, Northeast Ohio Medical University (NEOMED) has worked in collaboration with its educational, clinical and research partners to successfully train health professionals and medical researchers who serve and impact the region and beyond. The University trains students in a team-based, interprofessional environment and offers Doctor of Medicine (M.D.) and Doctor of Pharmacy (Pharm.D.) degrees, in addition to master’s and doctoral degrees and research opportunities in other medical areas.www.neomed.edu.